Orthoxil oil is an ayurvedic herbal massage oil for rheumatoid arthritis that provides relief from joint pain, stiffness and inflammation. 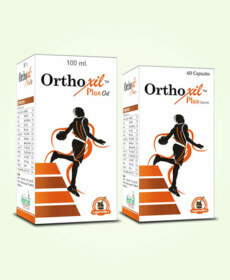 Buy Orthoxil oil online in India and improve joint strength and performance. Rheumatoid arthritis is caused by rheumatism which raises immune system malfunction. Due to this immune system starts attacking healthy cells of the body and destroys them, higher rate of cell death causes weakness in tissues and make bones, muscles, ligaments and other organs of the body weak. This condition is particularly severe on joints and depletes their strength and endurance by making ligaments, muscles, bones, tendons and cartilages weak and fragile. This condition causes misalignment of joints and makes them unstable. If not checked rheumatoid arthritis can make joints of the body immobile. Orthoxil oil is wonderful herbal massage oil for rheumatoid arthritis which stops progression of disorder and relieve its side effects. This herbal oil for rheumatoid arthritis relieves pain, stiffness and inflammation in joints and promotes movement, on regular use it strengthens joint organs and improves joint strength and endurance. 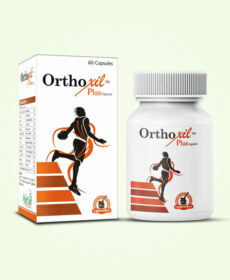 Orthoxil oil possess herbs and herbal oils like Ashwagandha, Asthisanghar, Nirgundi, Rasna, Guggul etc. and herbal oils like Gandhapurna, Jaiphal, Long, peppermint, Kapur etc. These ingredients collectively on topical application numb pain-signal carrying nerves and cast powerful anti-inflammatory properties to reduce pain and swelling. These curb stiffness and provide warmth to joint organs to promote movement. 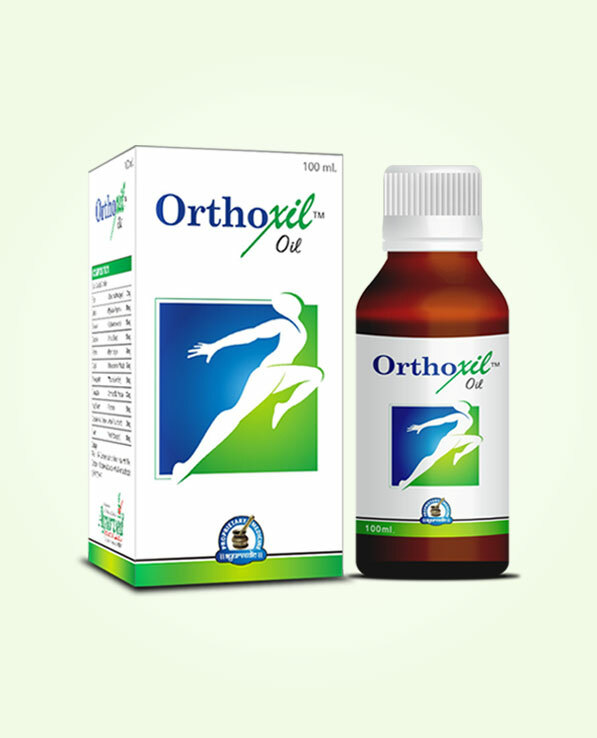 Orthoxil herbal massage oil for rheumatoid arthritis enhance flow of blood by relaxing blood vessels and nourish and repair damaged tissues and organs of the joint. Use of Orthoxil oil is excellent for treating joint stiffness and pain due to muscular pain, cramps or muscular lethargy occurring due to sudden pressure, injury, trauma or overuse. The ingredients of this oil prevent infections in synovial fluid and also prevent deposition of crystals of uric acid in joint-fluid which damage cartilages and make joints stiff. This ayurvedic herbal oil for rheumatoid arthritis curbs ill-effects of rheumatism and prevent its side-effects on joints. 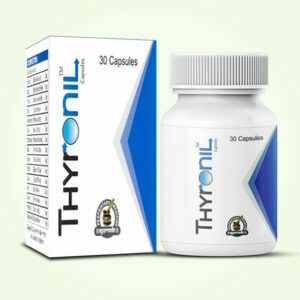 It also promotes repairing process of cartilages, muscles, ligaments and bones to improve joint stability and performance. Regular massage with this oil provides immense relief from RA and also prevents its symptoms like morning sickness, redness and tenderness in joints. Massage with this oil is beneficial for all types of arthritis and can be used by ageing individuals to maintain joint strength and performance. This oil is mild on skin and completely free of side effects even after prolonged use. This oil can be used by males and females of any age without any prescription. Rasna (Vanda Roxburghii), Arand (Ricinus Communis), Ashwagandha (Withania Somnifera), Nirgundi (Vitax Negundo), Asthisanhar (Vitis Quadrangularis), Guggul (Balsamodendron Mukul), Piplamool (Piper Longum), Nagkesar (Mesua Ferrea), Jaiphal Oil (Myristica Fragrans), Haldi (Curcuma Longa Linn), Akarkara (Anacyclus Pyrethrum), Gandhpatri Oil (Eucalyptus Globulus), Long Oil (Caryophylllus Aromaticus), Gandhpurna Oil (Gaultheria Fragrantissima), Tarpin Oil (Pinus Longifolia), Peppermint Oil (Mentha Piperata), Buleylu Oil (Sesamum Indicum), Kapur Oil (Camphora) and Arand Oil (Ricinus Communis). 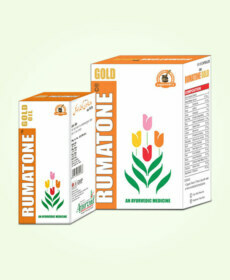 Take 10 to 15 drops of this ayurvedic rheumatoid arthritis oil and give a light hand massage to the affected area. This process should be repeated twice a day for 3 to 4 months regularly to achieve optimum results. Also remember to avoid direct fan for first 15 to 20 minutes of applying this oil. Stiffness and pain in my joints made me helpless. I wanted oil that could help me get rid of this stiffness. And then I finally found this! It eased my problem to a great extent.